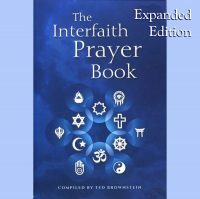 Bahai Prayers is the most recent edition of the general prayer book published by the Baha’i Publishing Trust. It uses “Bible paper” to make them slimmer and easier to carry. Choose soft cover, hard cover or deluxe leather edition from the pull-down menu above. Click on the picture to see images of each. My personal favorite is the Leather. It is flexible like the soft bound, but is more durable, with gold foil edges and a ribbon marker. I also like the star on the cover. The Hard Bound is less expensive, but it is less flexible for carrying in a purse. The Soft Bound (paperback) has a blind-embossed star on the cover and a textured cover stock that hides scuffs and fingerprints.